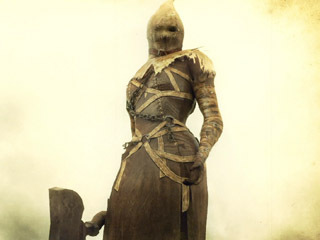 Executioner Miralda is a NPC in Demon's Souls. Executioner Miralda is King Allant’s personal henchwoman and a stain on the Boletarian Kingdom. She is notorious for her brutality and lack of compassion, and has an unyielding devotion to the king even in his current demonic misrepresentation. She successfully managed to imprison both Yuria and Biorr, leaving the nature of her devotion and power in question. It was once believed that Vallarfax of the Twin Fangs had ventured back through the fissure and returned to Boletaria to aid Biorr, but that he was captured and killed by Executioner Miralda. Speculation arose when players discovered a set of Brushwood armor in the dungeon where one encounters Miralda. Many had assumed that, since he was a member of a duo known as the “Twin Fangs,” both members would share matching armor sets. While still likely true, this has recently been put under skepticism when, upon further examination, it’s revealed that the armor set is not, in fact, exclusive to the elite group, but was once formerly the traditional armor of the Boletarian royal family. However, the Ring of Great Strength is exclusive to the duo, leading players to now assume that Vallarfax - still having returned to Boletaria - did not die by the hands of Miralda, but was killed by the dragon at their nest, where players can find several charred corpses, and most importantly, a Ring of Great Strength. She appears alive, at the top of the steps of the pit on the right hand side, which is located behind the gate in front of the Boletarian Palace. She scorns you for being a traitor to the King. She drops the Master's Ring and the Binded Cross Armor set when killed. Killing her shifts the world tendency back to neutral. She appears as a Black Phantom, at the top of the steps of the pit on the left hand side, which is located behind the gate in front of the Boletarian Palace. She drops the Guillotine Axe when killed. Killing her shifts your character tendency towards white. If she does fall down the pit she just dies and her items will appear in her original position after a reload of the stage. You can use this to your advantage, but be aware that killing Miralda with falling damage will not change your character tendency. Simply block and punish her rebounds. Dodging and countering is slightly more risky, as Miralda has an instant-speed uppercut that she can perform coming out of a roll or standing. Dodge her attacks when she is two-handing her axe and just keep chipping away until she goes down. Even simpler than above. Block every attack she throws at you, and wait for her to uppercut swing. Her back is vulnerable to critical hits, so keep repeating this process. Wait until she starts performing a combo or does a power attack, and then punish her with an attack of your own. Keep dodging or blocking her attacks as you can and be wary of her roll, as the attack follow-up can be lethal. Similar to the backstab strategy to begin with. Lure Miralda out and start running past the gate, towards the archstone. When you reach the archstone she should begin moving back towards where you found her. If you haven't destroyed the wooden barricades between the path leading down towards the gate and the archstone, she will walk into the barricade endlessly, with no reaction to any potential arrows to her face. Note: This was done with Thief's Ring equipped, which may or may not be necessary. Ideally equip the Kris Blade and Soul Ray. Although, Soul Arrow can be used at lower soul levels. Enter through the opened gate to the Execution Grounds. As you step off the walkway onto the grass, note the first raised platform of scaffolding directly in front of you. There is a small walkway between this platform and the castle walls – remember this spot! Now proceed to Miralda, lure her out and make sure she follows you down to this platform. Lock on so you are facing her and back up so the platform is on your left. The raised slope leading to her crib is on your right, and castle is behind you. She will follow you, but if you move around to the walk way mentioned earlier, between platform and castle then she will not follow you around the corner! So with any ranged weapon/spell you can move out from the walkway. When she has backed off a bit, range attack, then retreat back around corner to walkway and she won’t lay a chopper on you! If she loses interest just lure her back again. There is a sniping point next to the scaffolding, halfway up the hill between the Crystal Lizard and the second group of Dreglings. A bow can be aimed through the scaffolding to hit Miralda as she walks down the short steps in the player's direction. She needs to be led a small amount, so release the arrow when her shoulder enters the reticule. If you miss and Miralda keeps walking back, sprint to the top of the steps where you were aiming. Miralda should notice you right before she enters her building. With the Thief's Ring (or Graverobber's Ring for BP), Miralda loses aggro near the castle wall, far away from the player. The only possible danger is initially luring Miralda from her building. With a little practice, this strategy is safe enough to use with Hyper Mode: Clever Rat's Ring and Morion Blade, health below 30%. Cast Poison Cloud just before you enter the doorway. She won't see you and will take the full 900 points of damage without healing. Also, God's Wrath goes through the wall for an easy first hit. OR:Equip the Graverobber's Ring, run in and down the stairs. If she doesn't stop following you before you reach the ladder climb it down a bit. She will move back to her initial position. Now you can fire at her with your magic from the stairs. She will go forward but stop before she falls down. Do not fire too fast at her or she will roll to the side trying to doge it. If you position your character correctly, one cast of God's Wrath should send Miralda over the ledge, sending her to certain death. However, is this is not successful, you may have to try the method below. For an easy method of killing Miralda, you will need God's Wrath, Thief's Ring equipped and a bow with at least 150 arrows. Walk up next to the wall where she is standing at without going through the doorway or letting her see you Cast God's Wrath (which will damage her through the wall). Slowly walk to the doorway (not too close) until you can just see her. She should be glitching and just running in place at the wall. Shoot her with arrows until she dies from outside the room looking in. She will never attack you. Equip your Thief's Ring and lure Miralda some distance from her starting position. Gain ground until she stops chasing you and starts walking back to her alcove. Approach, backstab, and run away again. Repeat this process until she's dead. Note: If you do knock Miralda into the pit, you may still be able to get the items she drops. Load your game, or travel to the nexus and back to the entrance to the pit. You may find the items in the corner where she stands. Run straight past BP Miralda and halfway down the stairs, repeatedly use a ranged attack on her from this position. When her HP has been reduced by a third, she will begin to chase you. Retreat to the scaffold above where the colourless demon soul is located. She will jump from the top of the stairs to her death. You can retreive her weapon from the platform across from the bottom of the ladder. Equip the Thief's Ring and lure her outside, then wait until she attacks, dodge, and run back inside and down the first set of stairs. She will usually go back inside and stop at the top of the pit-slope. Walk halfway back up the stairs, and throw Soul Remains at her (if it fails then use a Bow to target the Soul Remains in front of her). If everything goes according to plan, she'll fall down the pit. Go pick up her drops, reload game or visit the Nexus and come back if they are unretrievable. Should kill Miralda in 2 hits, though retrieving her weapon can become difficult. This strategy is more aimed towards shifting the world tendency to neutral. To do this, equip the Dragon Bone Smasher in two hands, run in to where Miralda waits, immediately use an R1 attack (the angle should make this relatively easy), back out into the open, and then as she recovers and attempts to run out the doorway to follow you, smash her again with R1. The huge knock back on the Dragon Bone Smasher will send her straight over the edge and she'll die instantly on impact with the ground. Just when you enter the place near the first three dreglings there is a concrete Square Structure. Go to her and luring her bring her to this place. Now stay near the side where there is a stone. Lock her get back and front. There are times when she Strike her standard attack. Before she strike next strike her back with R2. If you strike after uppercut that would be dangerous. Keep striking her the first method told above. You get kill her without getting killed. Use poison or fire to do more damage. The easiest possibly way to kill Miralda is to attract her attention, block her attacks, and push her (Forward+R1) into the pit. There is a ladder leading down, so it is simple to grab her items afterwards. If she falls into the water, however, reload your game and the items should be in her spawn point. I have you now, wretched traitor to the king! I, Miralda, shall show you no mercy! Foolish traitor to the king! Are you dead already? Oh, you deserve it!